Goose Creek Fields and Goose Creek Meadows are east-side Tallahassee neighborhoods that include almost 200 homes in the popular 32317 zip code. Collectively, Goose Creek features newer homes with many of the features and amenities that today's homebuyer is demanding. 2016 has been an above average year for homeowners in Goose Creek who have wanted to sell their home, but the remaining three on the market are still waiting for buyers. This is the first neighborhood we have reviewed in quite some time where none of the homes on the market are under contract. The following list of homes are the most recent listings in Goose Creek. A red box will appear when no homes are listed for sale in the Tallahassee MLS, but check back again on a regular basis as this page updates 96 times daily. It is important to note that the narrative contained below is for sales through December for all previous years, but through the first week of November in 2016. The graphs and the closed sales table will be continuously updated into the future (meaning bookmark this page if you always want to know the current status of homes in Goose Creek). Goose Creek home prices are up nearly 6% when compared to the average recorded in 2015. The average recorded sales price has been $235,600 for Goose Creek through the writing of this report, which is roughly 15% lower than home prices in 2006 when the real estate market peaked but 31% higher than the market bottom in 2012. Home sales activity has been consistent with the best years going back ten years, but well short of the big numbers posted when the neighborhood was brand new. Based upon historically normal turnover rates in Tallahassee, we should expect to see 10 to 15 homes sold here each year, so 2016 should be seen as a "normal" year. 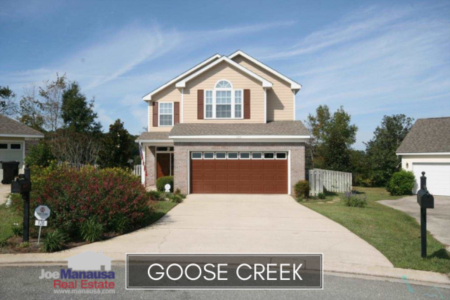 Thus far in 2016, there have been 12 closed home sales in Goose Creek. 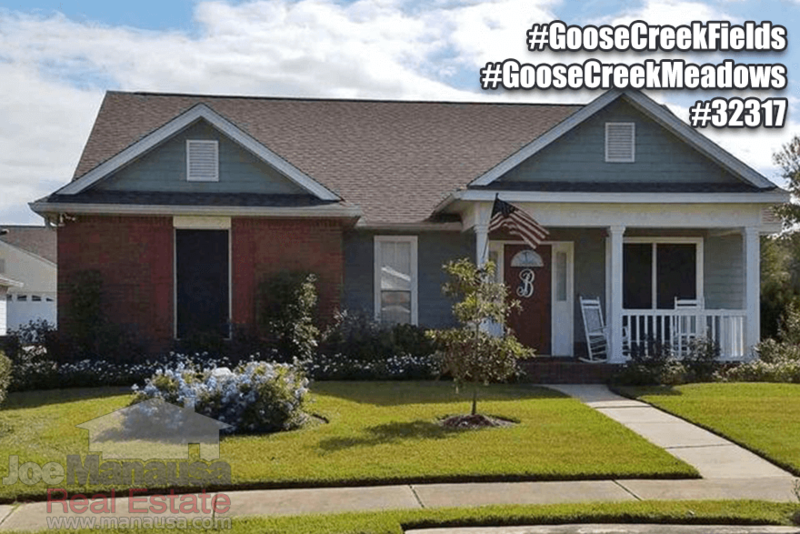 Goose Creek home values continue to rise, with this being the fourth consecutive year of appreciation (up 7.5% thus far in 2016 over average home values recorded in 2015). Through the first week in November, the average value of a home sold in Goose Creek has been $129 per square foot. This is up 29% over the bottom reached in 2012, and only down about 12% from the market high set back in 2006. Many homeowners who purchased resales now have equity, while those who purchased new are bearing the bulk of the valuation gap. 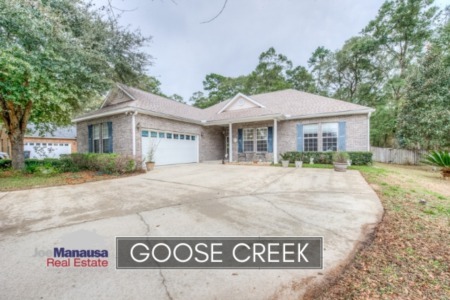 Currently, there are three homes for sale in Goose Creek. The fact that none are already under contract indicates sellers are ill-informed (most neighborhoods are reporting 35% of inventory under contract), or in fact are very confident that values are going even higher. Time will tell, just tune in to this page again to see what sells and what remains on the market (if any actually do). Goose Creek home sizes typically falls in a range of 1,600 to 2,000 square feet, and this year is no different. The 12 homes sold thus far in 2016 have averaged 1,824 square feet. The following list shows all 300+ home sales in Goose Creek going back to 2002 (the year home sales began here). I hope you enjoyed our November 2016 update on home sales in Goose Creek, please feel free to drop me a note if you have questions not covered in this report.